Delcia Lopez | dlopez@themonitor.com Nora Maldonado mother of Nydia Maldonado spoke to Oscar Davila Rodriguez during his sentencing hearing in the 139th District Court on Monday Nov. 26, 2018, in Edinburg. Rodriguez fled on the last day of his 2008 jury trial and was a fugitive until his capture in November. Oscar Davila Rodriguez appeared in court for his sentencing hearing for murder on Monday Nov. 26, 2018, in Edinburg. The Mission man wasn’t present the last time a judge sentenced him. He failed to appear on the last day of his 2008 trial when a jury convicted him of his ex-girlfriend’s death and sentenced him to 40 years in prison. Rodriguez, who fled to Mexico, was captured earlier this month in the state of Coahuila, which borders Eagle Pass, and was returned to Hidalgo County on Nov. 14, according to a news release from District Attorney Ricardo Rodriguez. The defendant, who was out on bond at the time of the trial, confessed to breaking into Maldonado’s McAllen home, choking her to death and stabbing her several times with a pair of tweezers to make her death look like a suicide, according to Monitor archives. He was first convicted in a 2007 trial, but a judge granted his request for a new trial because a witness testified about a polygraph test that had been ruled as inadmissible evidence. 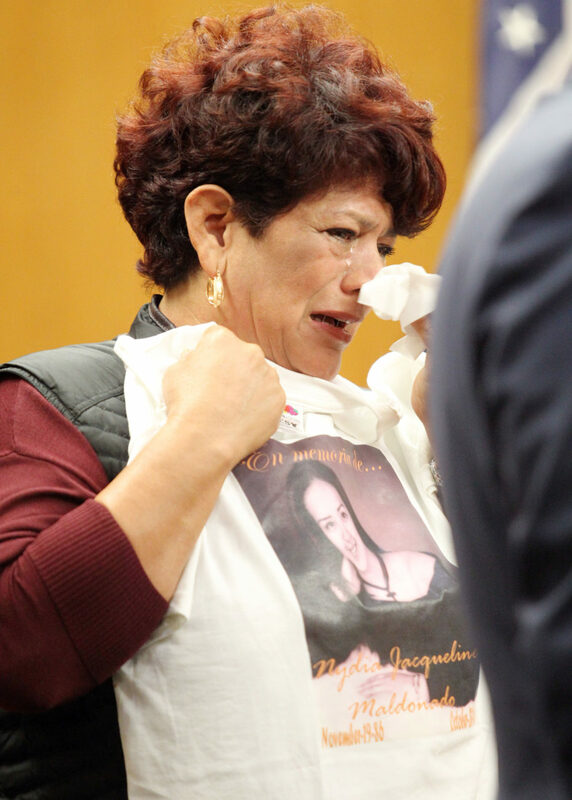 Nora Maldonado brought a T-shirt bearing her daughter’s photo to court with her Monday and held it in front of Rodriguez’s face while she gave a victim impact statement. Rodriguez, flanked by his attorneys Robert J. Salinas and Ricardo “Rick” Salinas, did not look at her and instead stared straight ahead. Maldonado told The Monitor she brought the shirt with her because she wanted Rodriguez to never forget the young woman he had killed, who she described as happy, charismatic and friendly. Her hope is that he serves the full sentence in case “he dares to do it again” and take someone else’s life. Rick Salinas asked the judge to allow his client to remain in the custody of the Hidalgo County Sheriff’s Office for 60 days, so he could file any post-judgment motions and prepare for a new charge against Rodriguez, who was arraigned on an indecency with a child by contact charge following his apprehension this month. “I think the time limits have expired,” the judge said in regard to a potential motion for a new trial filed by the defense. Typically, such motions must be filed within 30 days after the judge signs the order of conviction, which visiting judge Jaime Garza did July 18, 2008. Flores agreed to hold Rodriguez at the county jail for 30 days and set a hearing for Dec. 27, at which point this matter, and any others will be addressed.